We are just days away from the release of Ten From the Nations, assembled and edited by Dr. Rivkah Lambert Adler, and I am so excited!! 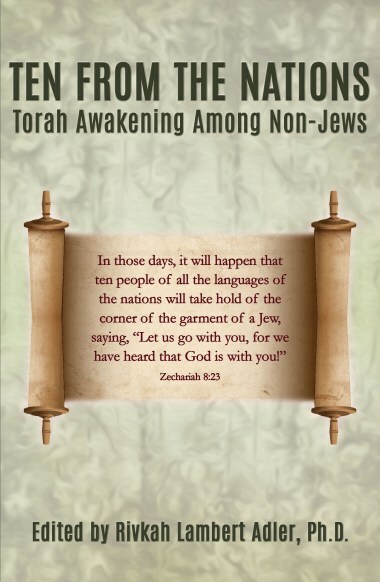 I have a pdf copy in hand and am reading and digesting the many testimonies of those from the nations who are at various points of the Torah Awakening. It is a terrific, exciting, encouraging and, at times, challenging read. Al McCarn and Mike Clayton, both published in the book, interviewed Rivkah and have an excellent exchange in the second hour of today’s Remnant Road episode. Listen in. You will enjoy! This entry was posted in Guest Post and tagged book release, Dr. Rivkah Lambert Adler, ger toshav, geulah, Ten from the Nations, Torah Awakening. Bookmark the permalink.